I've tried everything I can think of. Resetting the router, changing the channel number and band. The internet connection is fine, and then just hangs for a minute or 2, then returns to normal. The wifi icon remains connected, and I have the latest 10.10.4 update installed. At first I thought it was a DNS bug with Yosemite, and have played with the settings such as changing DNS provider, changing the IPV6 to IPV4 only etc. Driving me nuts. Has anyone had a similar problem? I've checked the surroundings with wifi scanners and have chosen the best channel available. It seems to affect my Macbook Pro Retina 13in Early 2015 a lot more than the other devices on the network. I'm using a Virginmedia Superhub 1. I was having a similiar issue with 10.10.3 which was not corrected when I updated to 10.10.4. Many, many things were tried before I got it to stay connected to WiFi reliably, however deleting the networking PLIST files seems to be what finally did it. Used Onyx to clear caches, run update scripts, etc. Disk Utility to verify/correct permissions. Reboot in Recovery Mode, use Disk Utility, some errors corrected then return value 8 and was told I had to backup, format, and restore to the drive. Rebooted and Disk Utility found no errors. Deleted the AirPort plist files (fix above) and WiFi has been stable. Wi-Fi dropping and losing Internet connection are two totally separate things. If your Wi-Fi drops, you lose connectivity to everything on your network. If your Internet drops, you only lose connection to the outside world, your internal network is still good. Below is a general picture of a home network with Intenet. 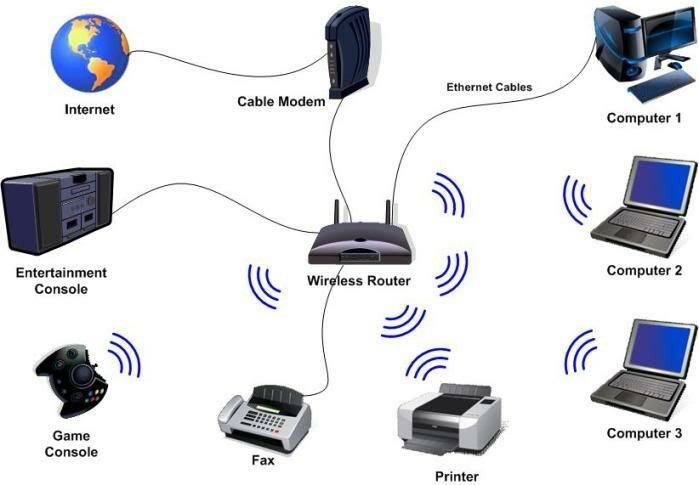 If the connection between the Cable Modem and the Internet dropped, you would still be able to communicate with all the other devices on the the network itself. For instance, you would still be able to print a document or stream music to your entertainment console from your iTunes library on your computer. First, let's determine if it is your Wi-Fi or your Internet. If your Wi-Fi drops, first it will appear disconnected (red or yellow dot) like mine is in the picture. You can also try and ping the router. If it fails now, then your Internet is not working and that will require a service call to your provider. 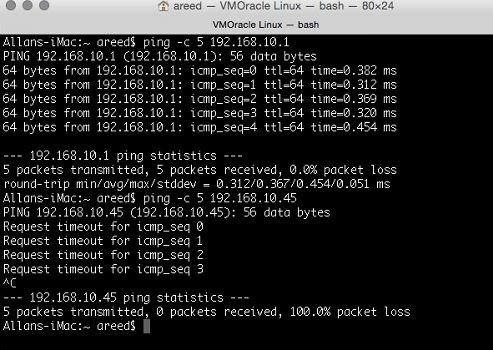 One other thing you can try is connecting an Ethernet cable directly to the router/modem and disabling your Wi-Fi. If you no longer have drops in service, we will know that you have an issue with Wi-Fi. It could still be either your computer or the router/modem, but we will know what is working and what is not. 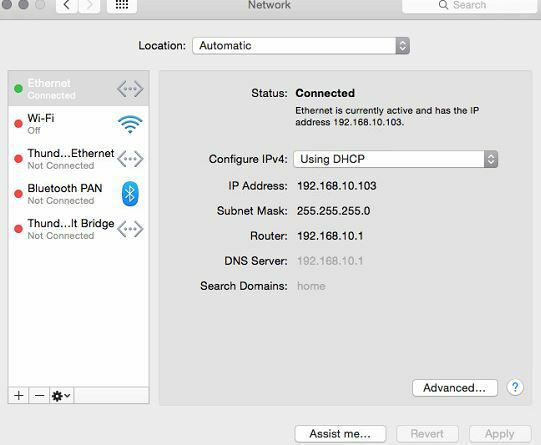 How can we tell if it is a Wi-Fi issue with either the router/modem or with your iMac? This is where another device comes in. If you have an iPhone or another computer or a tablet, check to see if you have connectivity when your computer's connection drops. If you do, then chances are it's your computer. More diagnostics and checking of settings, but time to setup up an appointment with Apple service. By disabling AirDrop, which I never use the wifi connection on my Virgin Media SuperHub 2 appears to be stable. All other devices, iPhones, iPads etc were not affected by the issue, so I believe it is something in the code for Yosemite to do with how wifi is managed that causes this issue. I am hopeful that El Capitan will have a different / resolved bit of code for this. Ok I've got to the bottom of this. It was my router. I have now upgraded from a Virginmedia Superhub VMDG480 to the latest Superhub 2ac. Its been over a week now and the connection is solid, so I'm answering this myself. Their latest kit has concurrent 2.4Ghz & 5Ghz, which I think has resulted in a more robust connection overall. Considering there where three phones, a media server, 3 computers, two tablets, a printer and an Xbox on at any one time, I just don't think the 2010 kit could hack it. Not to mention the extremely crowded 2.4Ghz band in my area. I think the reason it seemed to affect my Macbook more than other devices is that, after testing against other devices, the wifi reception doesn't seem as sensitive as other devices, meaning, it dropped the connection a lot more than devices at the same range. As a side note, my Galaxy Tab 8.4 Pro seems to have super robust wifi reception in comparison with the Mac. Ah, have this issue too. I must say though, when I purchased a new router and made the SuperHub in a modem, that's when it works the most. I still get the internet drop everyone and then. In fact, here is one proof. 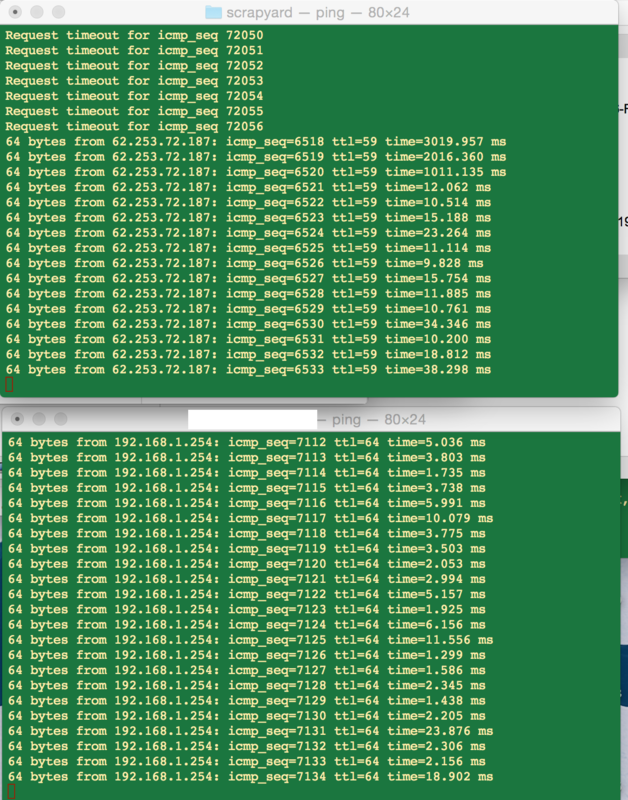 The terminal window above is pinging google and the one below is pinging the router I purchased and plugged to the SuperHub(now acting as a modem). While at the point of this screenshot, the internet was down. Other computer connected to the same router, the internet was on and they experienced no internet drop. Which is very odd. But that being said, getting the router and making the SuperHub did make me have the internet 4 out of 5 times, as opposed to 1 out of 5 times when connected directly to the SuperHub's wireless (2 or 5 GHz). Here you'll see the internet suddenly decided to come back up, while responses from the router below was still consistent. 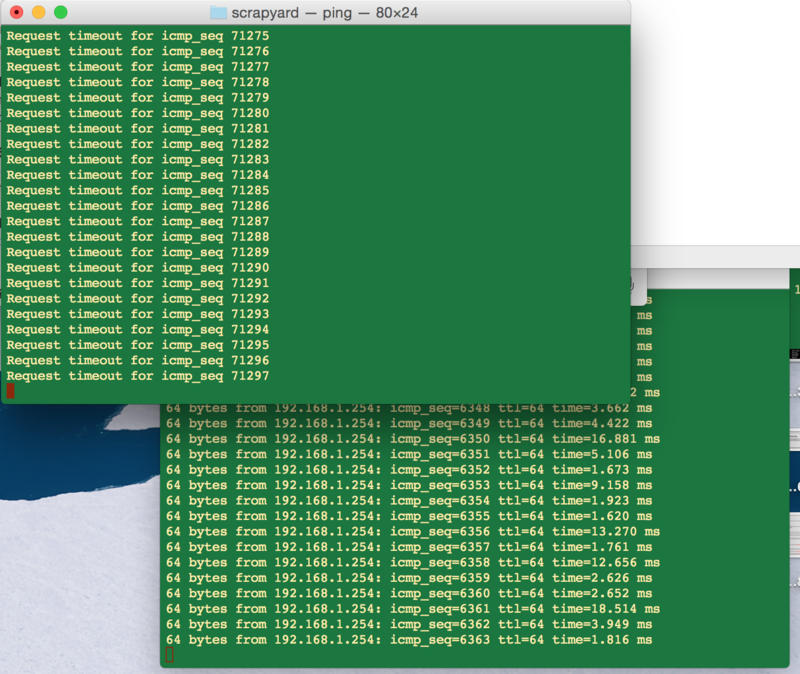 And this only happens on the MacBook Pro, no other system on the network (iMac). Still puzzle. The same thing happens to me! I don't know how to permanently solve this problem, however, but I find that turning Wifi off then on will solve the issue. This is only temporary though, because it always seems to drop the Wifi once every while. I have had the same problem. What seemed to work for me was deleting all the WiFi networks I had saved on my system in the 'Preferred Networks' list in settings, network, wifi, advanced. Then just re-joining the network i needed again. I tried all the solutions here, and nothing fixed the WiFi dropping. I was quite sure the problem was the cable because I tried a workaround to "protect" the cable. I put two coins in both sides of the cable to avoid that cable enter in contact with the button cover of the macbook... And the WiFi stopped working completely after a few attempts. That's how I was quite sure the cable was not OK. 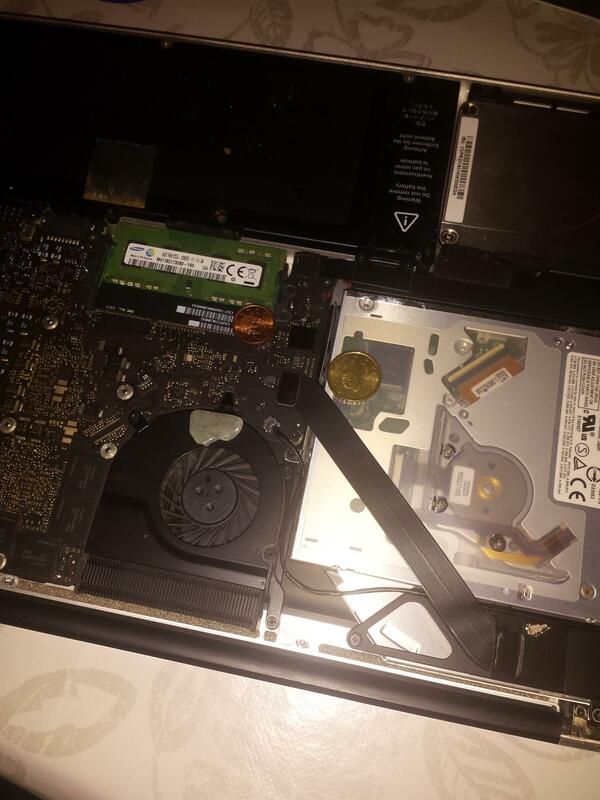 I toke a photo of the macbook and coins to remember! In my macbook pro early 2011 15", the cable was very easy to change. No idea in other models... Good luck! Not the answer you're looking for? Browse other questions tagged macbook yosemite wifi . Wifi hangs on early 2015 MacBook Pro?